This Monday to Friday, enjoy a guaranteed fare boost of up to 1.5x this week for GrabCar Economy 4 & 6 Seater trips. Remember: Fare Boost is the minimum you’re guaranteed to earn, so you can drive worry free! Head to these high demand regions to earn more on weekdays! 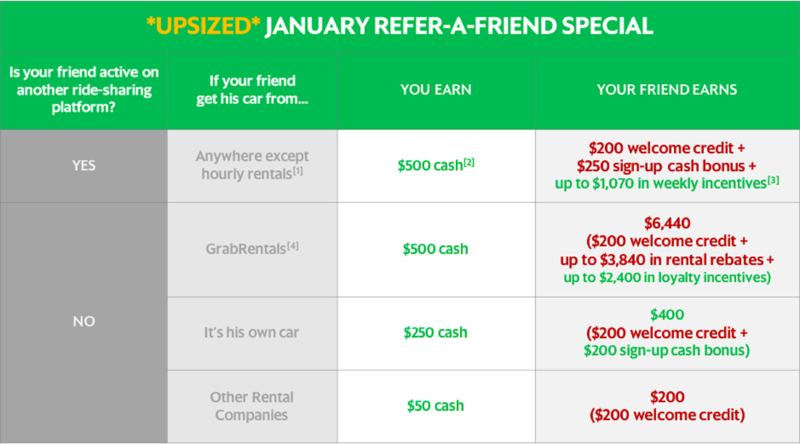 Earn 1.5x Usual Fares for GrabCar Economy 4 & 6 seater and GrabFamily, guaranteed! This Monday to Friday, enjoy a guaranteed fare boost of up to 1.5x this week for GrabFamily and GrabCar Economy 4 & 6 Seater trips. Earn more with 30% GrabShare Fare Top-Up! This week, from Monday to Sunday, continue to enjoy 30% more earnings with our GrabShare 30% Fare Top-Up! For example, if 2 passengers carpool with GrabShare final fares of $12 and $16 respectively, Grab will top up your total fares to $36.40! Join our Loyalty Program and earn up to $2,400! Don’t miss your chance to enrol for our loyalty program! You could earn up to $100 extra every week just by driving with us! Both new and existing drivers eligible.